Specificity/Sensitivity : Monoclonal Anti-Glucagon reacts with pancreatic glucagon in RIA and immunocytochemistry. The affinity constant of 6.1 x 10(8) L/M in RIA. 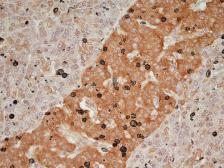 The antibody weakly cross-reacts with gut glucagon (enteroglucagon) in an immunohistological assay. Cross-reactivity has been observed with glucagon-containing cells in fixed sections of pancreas from human, porcine, dog, rabbit, mouse, rat, guinea pig, and cat. Specificity/Sensitivity : The epitope recognised by this antibody lies within the 1-14 amino acid sequence of cyclic somatostatin. Specificity/Sensitivity : The antibody recognizes by ELISA, NPY (human), NPY (porcine), NPY (sheep), NPY (13-36), NPY (18-36), and cross-reacts with PYY (human). It does not cross-react with neurokinin B (NKB), neurokinin A (NKA), substance P (SP), calcitonin, somatostatin and BSA. Specificity/Sensitivity : This antibody recognizes the COOH terminal end of substance P.
Specificity/Sensitivity : Somatostatin Polyclonal Antibody detects endogenous levels of Somatostatin protein.